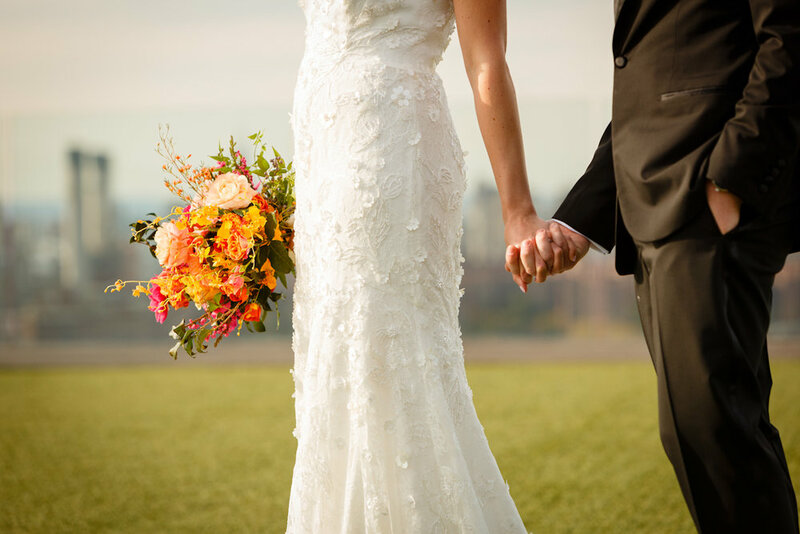 Halloween is Jenn and Alex's favourite holiday, so it was only fitting when they found that weekend available at the Liberty Warehouse, they decided they were meant to get married on Halloween weekend! 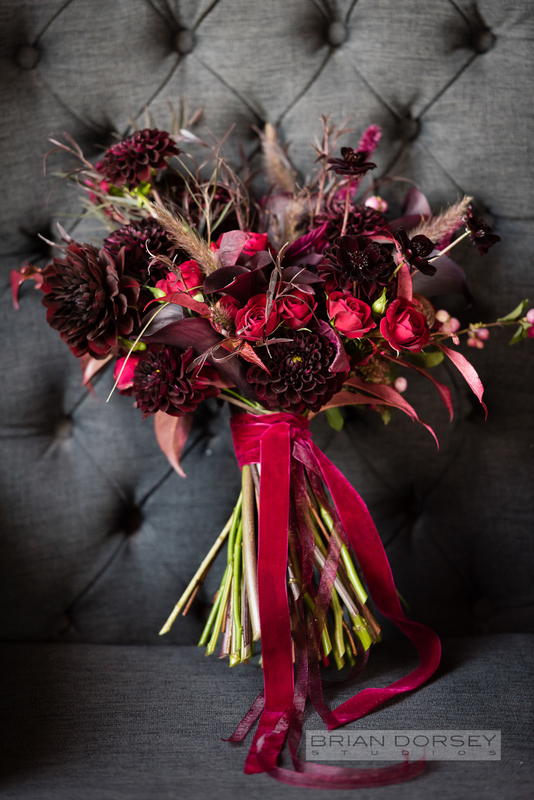 Their favourite colours are black and red and they wanted to create a dark, moody and deeply romantic black tie event. They were married under a dramatic chuppah of overgrown crimson reds and deep greens, with ivory candles in glass hurricanes at the base. Two black cast iron urns marked the beginning of the aisle. 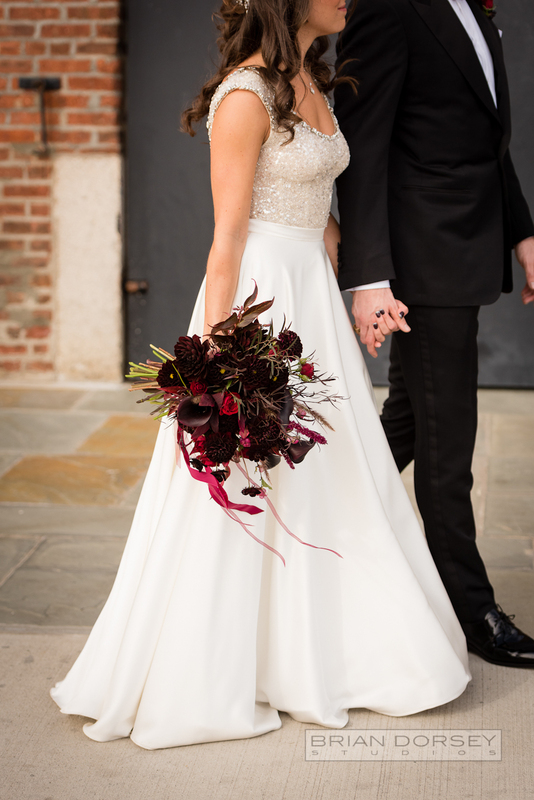 Jenn carried a bouquet with deep burgundy reds that were almost black. It was absolutely stunning against her elegant Lihi Hod two piece dress (a sequin, crystal and pearl top over a satin skirt). 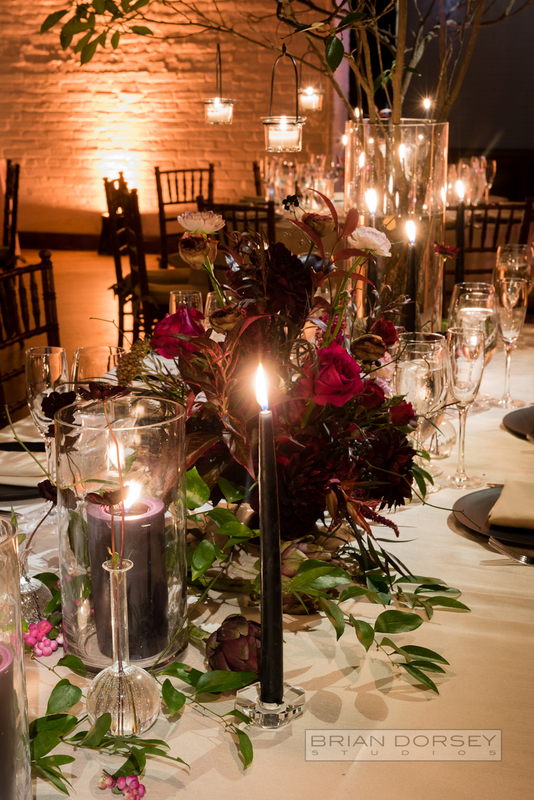 For the dinner reception Putnam & Putnam used black tapers in cut glass holders and black pillar handles in hurricanes which created a wildly romantic atmosphere. 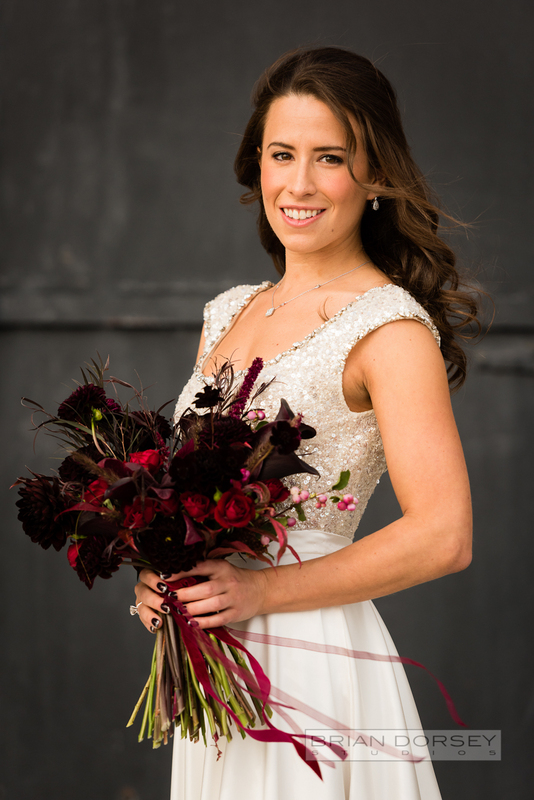 The crimson red and deep burgundy florals had such interesting texture and moment. They even used deep purple artichokes! 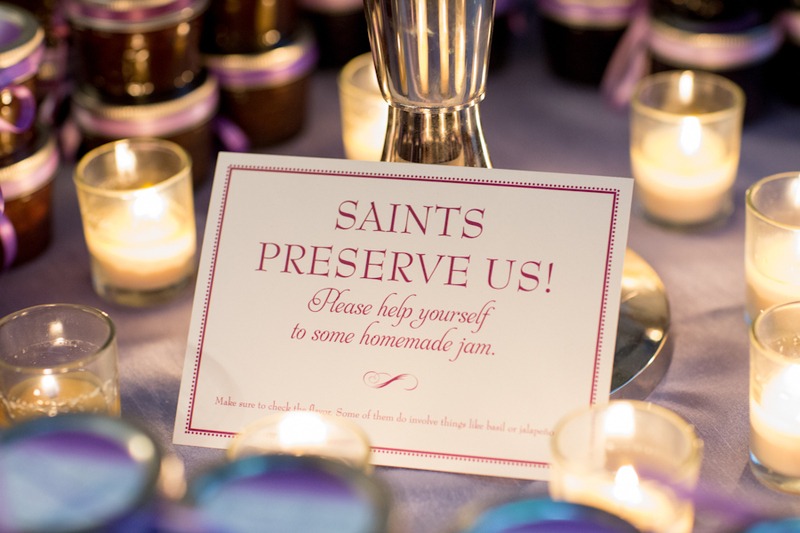 Jenn and Alex really wanted to create a fun party for their guests. We brought in the Brooklyn Oyster Party for the cocktail reception, where two attendants shucked a variety of oysters for guests to enjoy. We also had the Korilla BBQ truck come late night and serve Korean tacos and burritos to guests during the after party. Guests were encouraged to bring Halloween costumes to change into. For those who did not have them, we distributed a basket of masks for them to use. Nine Cakes created a cake with a tumble of sugar flowers, metallic gold brush strokes on the top tiers and gold foliage accents. Inside it had alternating layers of banana chocolate chip cake and dark chocolate cake, with two layers of cream cheese and a center layer of salted caramel frosting. YUM! One of Jenn's bridesmaids and good friends happens to be an amazing painter (Abe Design). 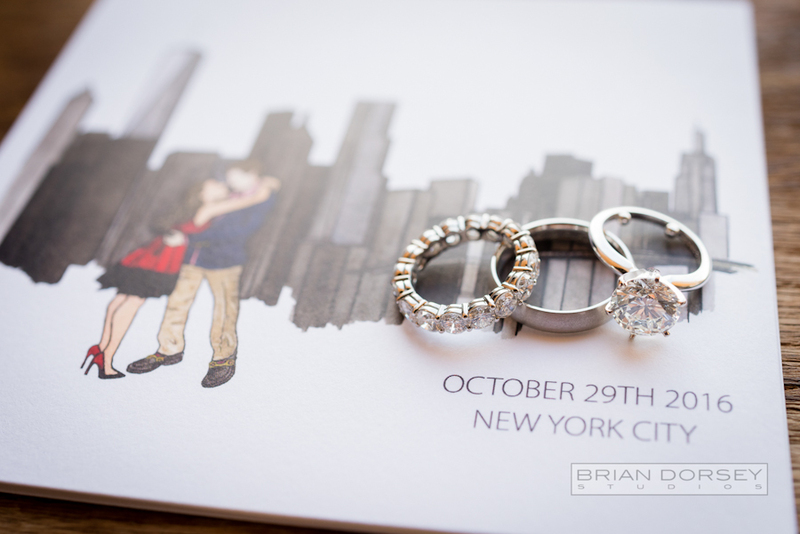 She painted pictures of Jenn and Alex from special moments in their lives together, which were printed in their save the dates. She also painted the day of programme, cocktail signs and a portrait of the bride and groom. Fourteen Forty designed their invitations and I loved the pearl white seal with an image of a masquerade mask that was used to hold the modern suite together. This was such a unique celebration and we were so happy to have been a part of! 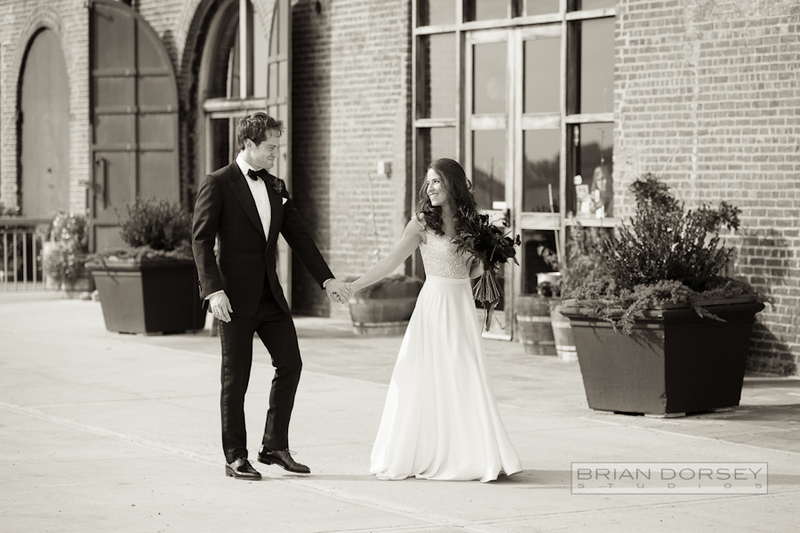 Thank you to Ron at Brian Dorsey Studios for capturing all these special moments! 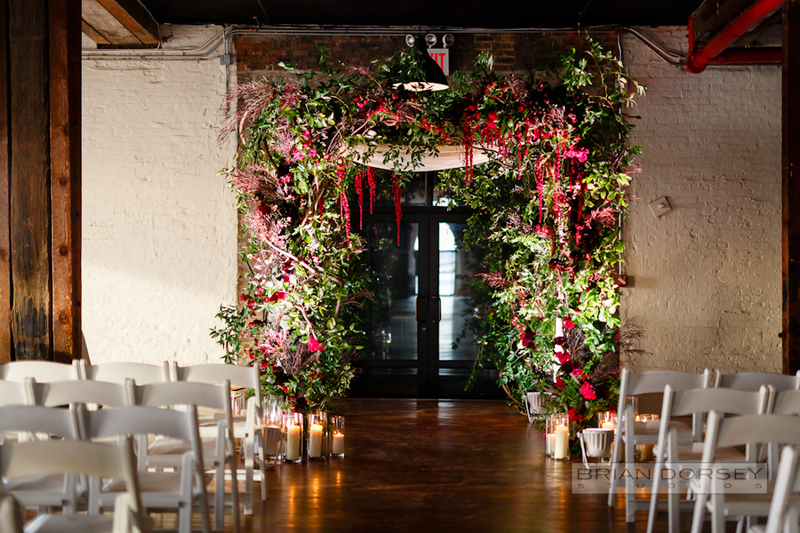 The Weylin in Williamsburg Brooklyn is such a stunning and unique venue. Every time I go there I marvel at that ceiling. 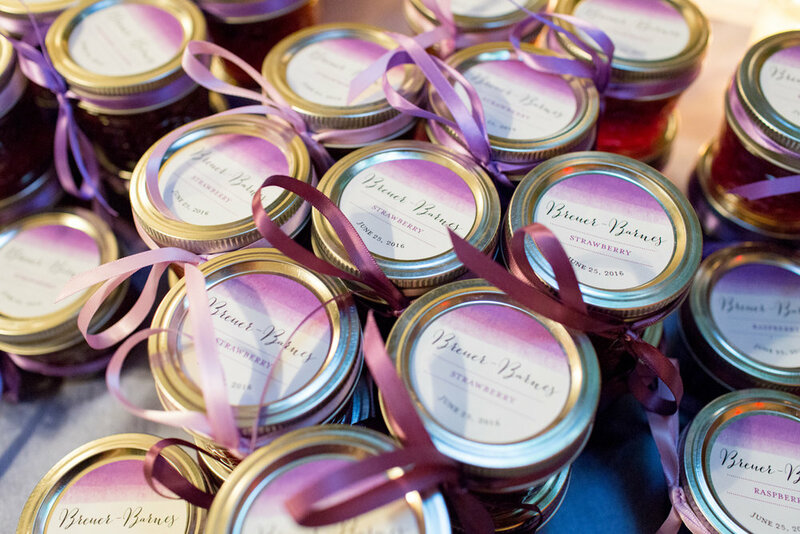 I was super excited to work there for this wedding! 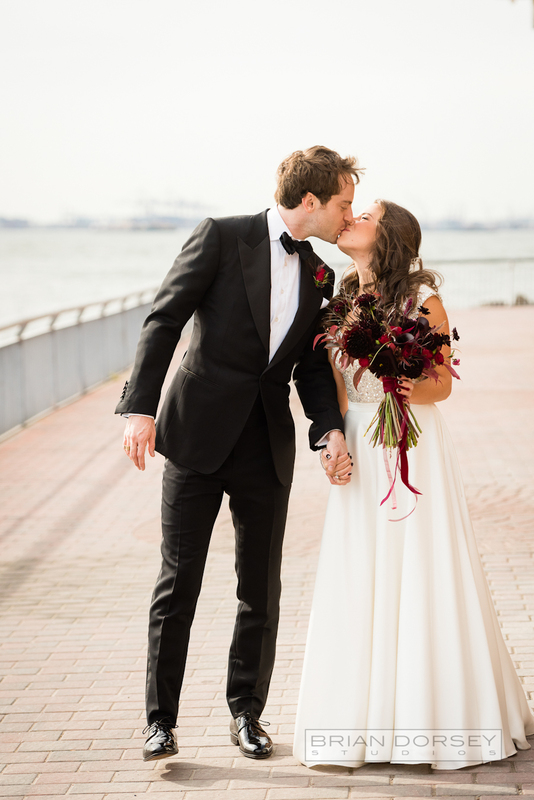 The bride loved colour and Putnam & Putnam brought a bold and colourful take to this black tie wedding, while still remaining elegant and refined. For the palette, they used a variety of shades through red, fuchsia, orange and golden yellow with a touch of purple and plum. Nine Cakes outdid themselves with a textured buttercream cake, gold painted details, sugar flowers and pink peppercorns (now my new favourite cake detail!). Blaire Band entertained while guests enjoyed their delicious meal from Abigail Kirsch Catering. I love working at raw spaces with plenty of character where we can bring in all the rentals (down to the last teaspoon) and make it really special. The aztec gold linens, ornate chargers and bone white reception chairs from Party Rental Ltd made for the perfect stage for the bright floral palette. At the end of the night, the guests went downstairs to the 1875 Bar where the after party continued the celebrations. Complete with a dozen pies from a local pizza restaurant. The perfect end to a super fun night! Thank you to Ron at Brian Dorsey Studios for catching all these moments. Bingqing and Han were married in a snowy winter day in New York. We had really lucked out as there was a big snowstorm the day before. The day of the wedding, the skies were clear, but the ground was blanketed in a bright white layer of fresh snow. 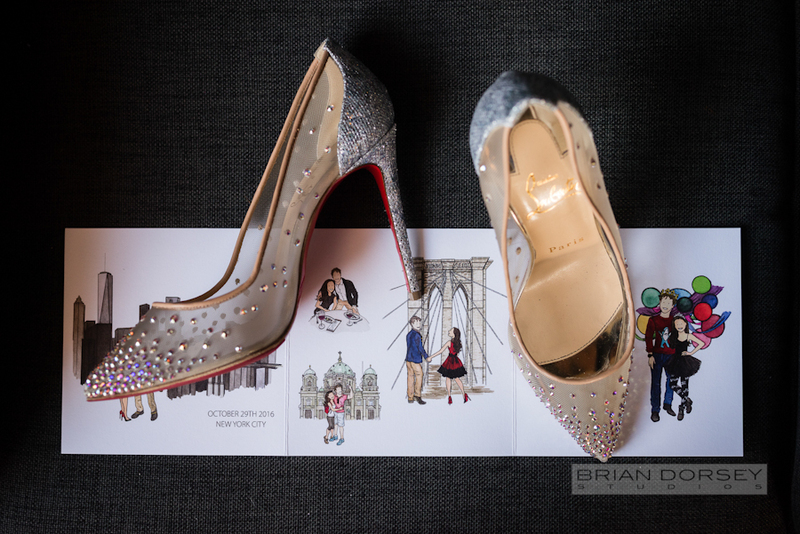 The bride is an architect and she had designed their invitation suite with a detailed hand illustration of The Foundry. Prior to the guests arriving they had a Chinese tea ceremony with close family to pay respect to their elders and receive good wishes for their marriage. This was followed by an intimate wedding ceremony, officiated by a friend of the couple. 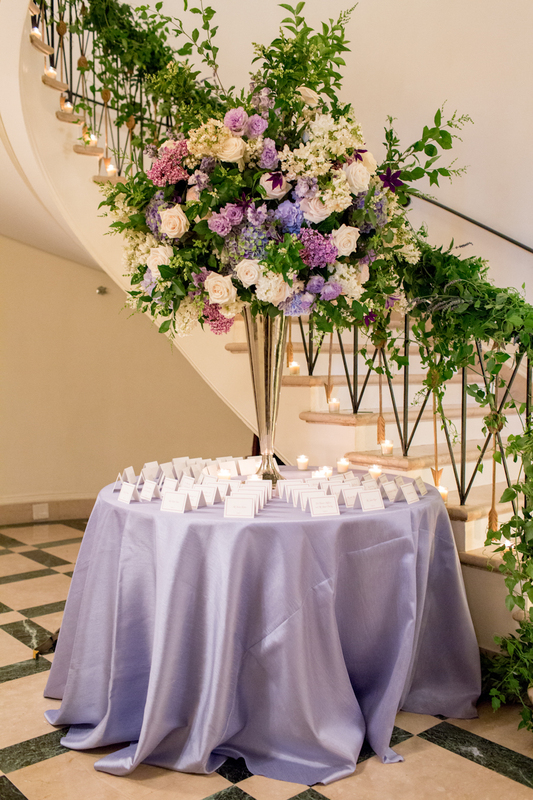 We kept the palette clean with creamy whites and crisp greens. 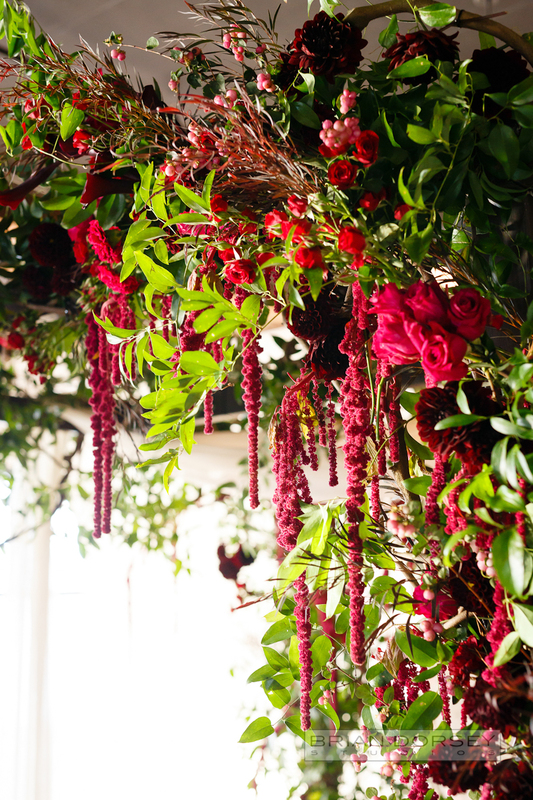 Going into dinner, Poppies and Posies added more colour with blush, dusty rose and pops of burgundy in the florals. The two long tables were scattered with a sea of elegant tapers in different aged brass candlesticks and crackled amber and pale grey votives. Their elegant wedding cake from Nine Cakes had two different flavours. The bottom tier was lemon cake with layers of lime curd and orange zest cream cheese buttercream. The top tiers were rich chocolate cake layered with cloud like caramel buttercream, fleur de sel and roasted pecans. Bingqing loves to sing and instead of doing the traditional mother son and father daughter dances, they decided to have both sets of parents dance with each other and Bingqing sang a beautiful Chinese song. 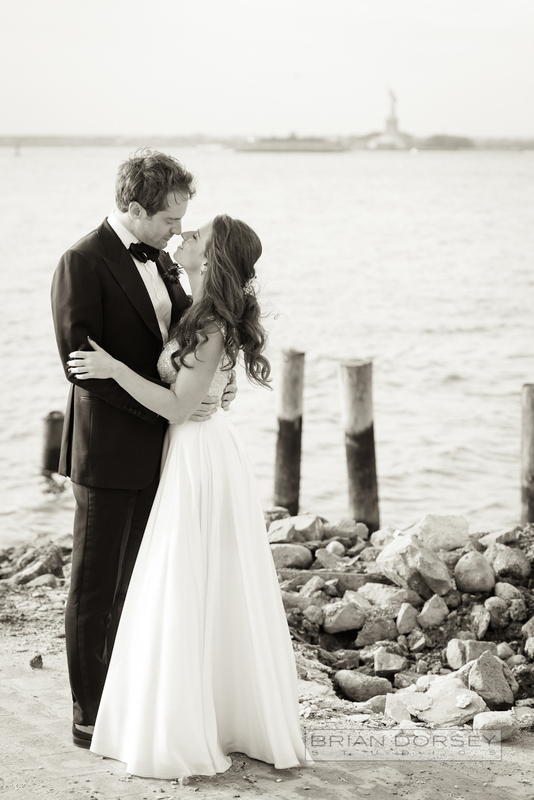 It was such a sweet and intimate winter wedding and we were so happy to be part of it!